Samuel Coale, professor of english, recently co-edited the book Nathaniel Hawthorne in the College Classroom with Christopher Diller, professor of english rhetoric and writing at Berry College. This compendium includes biographical, literary, historical, and multidisciplinary scholarship from a wide array of scholars and professors. 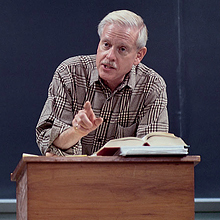 Special interest is given to teaching issues of gender, science, and visual culture as related to Hawthorne’s works. The text itself is divided into four specific sections: The Romances, The Short Stories, Institutional and International Contexts, and Performative and Visual Contexts. Coale also recently contributed to the volume Critical Insights: The Scarlet Letter, edited by Brian Yothers. Coale’s opening section provides a reception study of The Scarlet Letter and Hawthorne, and focuses on the fact that the book has never been out of critical favor. He is currently concluding research on the nature of the contemporary sublime. This project may link such as Wordsworth, Faulkner, DeLillo, Pynchon, Proust, and Morrison.